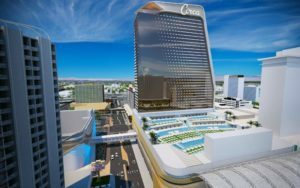 CIRCA RESORT & CASINO IS DOWNTOWN’S NEW PROJECT: The long wait and mystery are finally over for the plans for Downtown Las Vegas’ first casino-resort being built from the ground up in more than three decades. Developer Derek Stevens, co-owner of the D and Golden Gate properties, unveiled renderings of Circa Resort & Casino expected to open in December 2020. No longer will we refer to it by the working title 18 Fremont, which is the address. Stevens at a VIP event explained the fortuitous situations which allowed deals to be made to purchase the Las Vegas Club, three small properties – Glitter Gulch, Mermaids and La Bayou, and finally a T-shirt shop giving his company the rights to a whole city block for building Circa. Many more decisions are yet to be made such as the restaurants, but Stevens announced some of highlights. He was blown away when he first came to town and saw the Las Vegas Hilton’s (now Westgate) SuperBook so he’s excited to build a three-level, stadium-style sports book and making it the largest. Keeping some of the past, the famous Vegas Vickie sign will be inside the lobby. A new approach will be the Garage Mahal, which will integrate ride sharing. The hotel tower will be the tallest north of the Strip and with 777 rooms. On the roof will be six pools, a 125-foot TV screen, and space capacity for 4,000 guests. The rooftop will be used for festivals, concerts, sports watch parties, etc. Stevens only arrived in Las Vegas in 2006, yet he is already a modern groundbreaker for the city who holds Las Vegas original pioneers in high regard. In many ways, he and his partner-brother Greg are the right people at the right time. 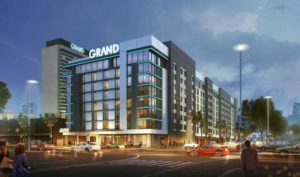 FUTURE PLANS FOR DOWNTOWN GRAND: The Downtown Grand today plans to add a third hotel tower with seven guestroom floors adding 495 rooms with an opening expected in mid-2020. With the new addition, the resort will have 67 studio units, 20 one-bedroom suites, and three presidential suites, each boasting nearly 1,500 square feet of living space. The new tower on the east side of the property will bring the downtown resort’s room count to 1,124. 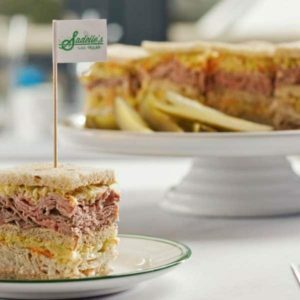 NEW SADELLE’S RESTAURANT OPENS AT BELLAGIO: Sadelle’s, SoHo’s vintage-style restaurant from Major Food Group, opened in Bellagio overlooking the resort’s conservatory. Major Food Group’s other Las Vegas dining experience, which opened in 2015, is Carbone at Aria. Sadelle’s brings an elevated perspective to all-day dining daily opening for breakfast at 6 a.m. and segueing through lunch and dinner until midnight with approachable cuisine usually found in cafés and bakeries. The 10,000-square-foot environment envelops guests with a combination of colorful pastels and touches transporting diners back in time to a grand café along an old European boulevard. Design highlights begin with an impressive entrance featuring a bakery cart, crystal chandelier, herringbone parquet floors and paneled blush walls. The main dining room can shift seamlessly from a bright airy lunch spot to an intimate nighttime destination. The elevated bar-and-lounge is highlighted by a demilune bar, clamshell lounge chairs and serpentine sofas. A private dining room offers a nod to Art Nouveau with the upholstered walls having a feathery botanical print and the carpet radiating a starburst pattern. SMOKED BURGERS & BBQ OPENS AT FORUM SHOPS AT CAESARS: Designed and operated by Hospitality Boulevard, Smoked Burgers & BBQ is now open at The Forum Shops at Caesars. 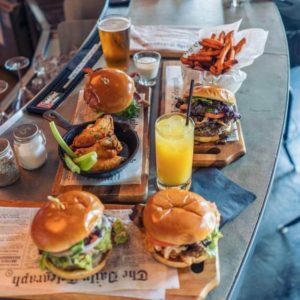 The menu consists of BBQ favorites with a twist prepared with West Coast flare along with handcrafted cocktails including shaken specialties. Signature dishes include: World Famous Pig Candy; Loaded BBQ Nachos; Smoked Chicken Wings; Buttermilk Fried Chicken Blueberry Sliders; Louisiana Hot Link; Smoked Pork Sandwich; Chopped Beef Brisket; and Salted Caramel Banana Pudding. ‘XAVIER MORTIMER’S MAGICAL DREAM’ MOVES TO BALLY’S: “Xavier Mortimer’s Magical Dream” is moving from Planet Hollywood to the 250-seat Windows Showroom at Bally’s and opening on a larger stage with new visuals on Saturday, Jan. 19. The magician’s production will also have a new show time, 6 p.m. Thursday through Saturday, and offer opportunities for audience participation. 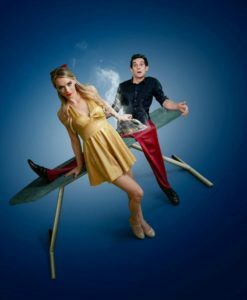 The program depicts Mortimer’s dream world and his quest to win over his love interest, Belle, played by Allie Sparks, through 14 acts of spellbinding illusions, eccentric characters, dancing and animations. Tickets for the 70-minute show start at $49 for general admission and $69 for VIP. Mortimer began performing on the Strip in 2013 when he joined Cirque du Soleil’s production, “Michael Jackson ONE.” Subsequently, he is the first performer from a Cirque show to headline his own show on the Strip. 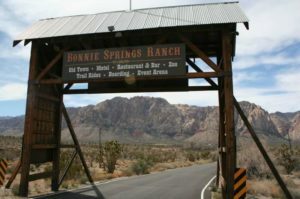 BONNIE SPRINGS BEING SOLD: Here goes another piece of the Vegas Valley’s history with Bonnie Springs being sold to home developers. Originally built in 1843 as a stopover for wagon trains going to California along the Old Spanish Trail, Bonnie Springs Ranch lies in the heart of Nevada’s Red Rock Canyon about a half hour from the Strip. The ranch was opened to the public in 1958 as a tourist attraction. Over the years the destination added a restaurant, petting zoo, Old Town, and much more. The proposed plan is to build around 20 homes and to duplicate some things available to the public such as a restaurant, country inn and event barn for weddings. Part of the deal is for construction not to begin until a good home is found for all the animals. 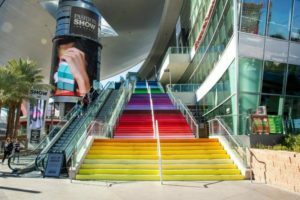 STAIRCASE MURAL ADDS VIBRANT COLORS TO FASHION SHOW MALL: Hard not to notice and smile at the rainbow-colored Strip-side staircase mural outside the Fashion Show mall. The one-of-a-kind three-dimensional painted installation titled “Colors That Speak to a United City” was created in partnership with muralist Tanya “Miscre8” Watler and curator Patrick Duffy. This exclusive artistic experience features a 73-individual-colors and took the artist 72 hours to complete. The 50-foot mural resembling a cascading rainbow is a tribute to diversity, inclusion, hope and optimism. Watler began her artistic career in the 90s on the streets of her hometown, Harlem, N.Y., with her colorful whimsical street style. Watler has works featured in such locations as Delano Las Vegas, Zappos, Art Live, and Life is Beautiful. 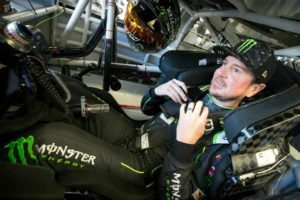 NASCAR CHAMPIONS WILL PARTICIPATE IN TWO-DAY TEST SESSION: Four NASCAR Cup Series champions with a combined 10 titles will be among 14 drivers tentatively scheduled to participate in a two-day test session at the Las Vegas Motor Speedway Jan. 31-Feb. 1. This track activity will be a month before the speedway’s first NASCAR tripleheader weekend of the year. 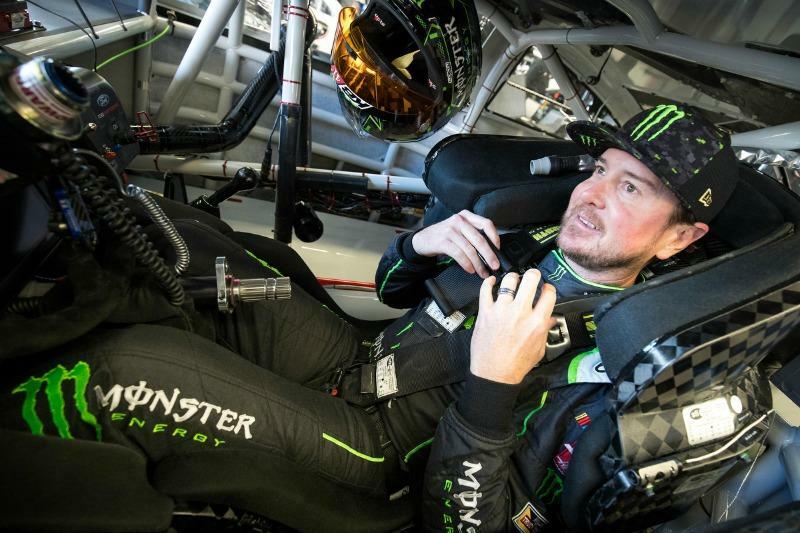 Seven-time NASCAR champion Jimmie Johnson, Las Vegas-born Kurt Busch (2004) and Kyle Busch (2015), as well as 2012 champ Brad Keselowski, will be on-hand along with other drivers for testing. The sessions are open to the public free of charge. A section of the main grandstands and pit road will be open to fans. Tentatively the schedule will run from 8 a.m. to 6 p.m. on Thursday and 8 a.m. to 1 p.m. on Friday. Food and beverage options will be provided for purchase at the track. CIRQUE DU SOLEIL®’ HOLDS ANNUAL FUNDRAISER AT SPRINGS PRESERVE: Characters from the six Cirque du Soleil shows in Las Vegas, will once again be present during the 18th annual “Run Away with Cirque du Soleil” 5K run and 1-mile walk on Saturday, March 2 at Springs Preserve. All proceeds will benefit the Spring Preserve and Cirque du Soleil foundations. The popular event opens at 7 a.m. and begins with pre-race programming at 7:30 a.m. followed by the race at 8:30 a.m. At 9:30 a.m., there are special performances, awards and raffle drawings. Early bird registration is $37 for adults and $27 for children (3 to 12) for the 5K, and $27 and $17 for the walk. Price increases by $3 on Feb. 17 and there are military and senior discounts. Participants are encouraged to dress in a Cirque-inspired look for a chance to win a prize for a Cirque show. Interesting note, this year’s event will be the final chapter of “Run Away with Cirque du Soleil,” because 2020 will introduce a new tradition and format. URBANeats Market located inside Allure Las Vegas on Sahara just west of Las Vegas Blvd. opened last week. 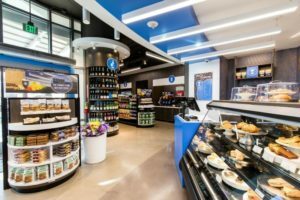 This is the first outlet for URBANeats Market offering a bodega-style market catering to people on-the-go looking for fresh food. This is the first of three planned stores set to open this year in Las Vegas. Look for a new restaurant, Big Whiskey’s American Restaurant & Bar, to open in Town Square in the early part of this year. This is going to be the restaurant’s first location in the West. The original concept was launched in 2006 in Springfield, Mo. Now there are 10 locations in the Midwest serving American classics for lunch, dinner and late night along with happy hour cocktails. El Dorado Cantina off the Strip behind Circus Circus on Sammy Davis Jr. Drive will be recognizing two food observance days with food specials. 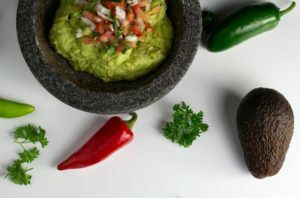 On Wednesday, Jan.16 International Hot & Spicy Food Day, the Mexican restaurant will offer tableside Spicy Guacamole or host Chili Guacamole for $10. On Sunday, Jan. 20 National Cheese Lovers’ Day, El Dorado will feature $5 off Cheese Enchiladas, Queso Fondido and Cheese Quesadillas. The next Taste & Learn wine event at Ferraro’s Italian Restaurant & Wine Bar will be held on Saturday, Jan 26 at 5 p.m. Chef Francesco DiCaudo’s four-course menu will be paired with wines from the Malvira winery, located in the heart of Piedmont’s Roero wine country. Reservations required, call 702-364-5300. Cost is $65 inclusive. Remedy’s Conestoga at 530 Conestoga Way in Henderson is holding its 9th Annual Hillbilly Ball on Saturday, Jan. 26 from 8 p.m. to midnight with drink specials, live music by Thrillbilly Deluxe, costume contests, etc. Wear your best hillbilly duds. Also, on Saturday, Jan. 26, Remedy’s St. Rose at 3265 St. Rose Parkway in Henderson will be holding its second White Out Party at the same time with drink specials and a DJ. For this event, wear all white! Some special offering acknowledging National Pizza Day on Saturday, Feb. 9 will include: S’mores Flatbread at La Cave Wine & Food Hideaway in Wynn for $13; Lasagna Pizza at Trevi Italian Restaurant in The Forum Shops at Caesars for $21; Gyro Pizza at Greek Sneek in MGM Grand for $19; and Grilled Chicken Pizza at Crush also inside MGM Grand for $19. WYNN MASTER CLASSES CONTINUE: How fabulous is it for the public to have access to a series of behind-the-scenes workshops led by master chefs, vintners, bakers and artisans held exclusively at Wynn. Registration is required and there is a cost with tax and gratuities included, call 702-770-7070. On the resort’s website, classes are currently listed through May 3. A Master Dumpling Class will be held on Thursday, Jan. 17 at noon in restaurant Wing Lei. Master dim sum Chef Sandy Chi will join Chef Chen Wei Chan of Red 8 at Wynn for an encore of their popular dim sum workshop with a lunch following. Attendees will cover wontons and wrappers to fillings and dipping sauces, and pan frying to crispy perfection. Cost is $175. The class with a pizza lunch on Thursday, Jan. 24 will be Pizzaiolo For A Day held in Allegro at 11 a.m. 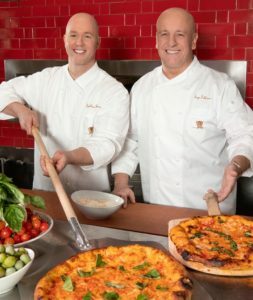 This will be Wynn’s first Master Pizza Class with chefs Jonathan Bauman of The Buffet at Wynn and Enzo Febbraro of Allegro sharing secrets for making flawless dough and then shaping and building classic Margherita, deep dish and thin crust pizzas. Cost is $150. 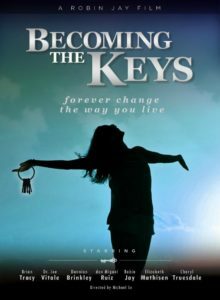 INSPIRATIONAL MOVIE PREMIERE OPEN TO THE PUBLIC: “Becoming the Keys,” is the third installment in the inspirational Key Movies series by local writer, producer and president of the Las Vegas Convention Speakers Bureau, Robin Jay. The movies mix fictional characters interacting with today’s leading reflective influences, including authors Don Miguel Ruiz of “The Four Agreements: A Practical Guide to Personal Freedom” and Dannion Brinkley of “Saved by the Light.” The compelling narrative reflects on embracing the seven keys to greater success and a happier life. The seven keys are: appreciation, harmony, passion, courage, faith, vibration, and empathy. The movie premiere will be on Thursday, Jan. 17 at 7 p.m. in the South Point’s showroom. General admission tickets are $25 and available at the casino box office or Ticketmaster. A portion of the ticket sales and silent auction proceeds will benefit Volunteers in Medicine, Southern Nevada. Global Winter Wonderland, the spectacular lantern festival and multicultural theme park outside at the Rio, is offering a buy-one, get-one free offer on their Unlimited Carnival Ride passes through Mon., Jan. 21. Normally $25 per person, the BOGO unlimited carnival ride offer is available when purchased at the on-site box office. The Mecum Motorcycle Auction showcasing an array of world-renown motorcycles will be held in the South Point Exhibit Hall Tuesday, Jan. 22 through Saturday, Jan. 26. Registration is required to attend. Rita Moreno is being honored as Woman of the Year at the fundraising Black & White Ball for Nevada Ballet Theatre. The black and white formal dinner on Saturday, Jan. 26 will be held at Aria with a 10:30 p.m. after party at Jewel Nightclub. Following the adult revue “Fantasy” at the Luxor on Valentine’s Day, Thursday, Feb. 14, the show’s 2019 “The Golden Goddesses of Fantasy” calendar will be available for guests as a complimentary gift while supplies last at the merchandise counter. The calendar retails for $20. SUMMERLIN CONTINUES TO GROW: Las Vegas master-planned community, Summerlin®, a development of The Howard Hughes Corporation®, had a 25 percent increase in home sales in 2018, which moved it up from the No. 4 spot to No. 3 on the national ranking by RCLCO, a leading national real estate consultant ranking MPCs since 1994. Last year, 1,318 new homes were sold in Summerlin, the community’s strongest performance in more than a decade. Summerlin is home to retail destination Downtown Summerlin, where 10 new stores opened and the annual visitation in 2018 topped 18 million. Other landmark projects there include City National Arena, the practice facility and home of the Vegas Golden Knights, and Las Vegas Ballpark®, a Triple-A baseball stadium and future home of the Las Vegas Aviators®.